Regardless of the size of your kitchen, it never seems like there’s enough cabinet or drawer space. This is where these kitchen organizing tips can be very helpful. When you hang a few adhesive hooks to the inside of your cabinet doors you’ll have somewhere to hang things like measuring cups, oven mitts, and other miscelaneous items. 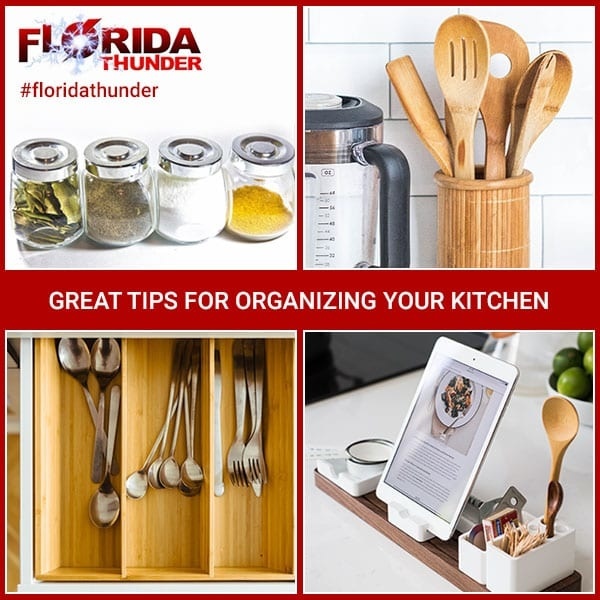 You can even buy some plastic folders from your local office-supply store to put your Tupperware lids in or a file organizer to hold your cutting boards. While we’re accustomed to using tension rods to hang curtains, they’re also a great way to streamline kitchen cupboards. When installed vertically on a shelf they’ll create dividers you can then use to store baking sheets, muffin tins, and cutting boards so they don’t come tumbling out on you. This kitchen organizing tip will save you some time too. It’s easy to forget what’s hidden deep in the back of your cabinets if you don’t have pull-out shelves here. With these in place you’ll avoid knocking over all your pans as you reach for the right one. Your kitchen is much more than doors and cabinets. You also need to keep your fridge organized with this kitchen organizing tip: Use clear plastic “trays” to separate your cheese, condiments, and baking supplies. When you’re grilling outside, simply grab your whole condiment or cheese tray and take it with you. Additionally, this will keep your fridge clean so you won’t be scrubbing its deep corners all the time. It only makes sense to store items close to where you’ll be using them, which is why your small implements should be in a drawer closest to said area. For instance, you should put your prep items (e.g. lemon press, measuring cups) in a drawer in your kitchen island. On the other hand, your cooking items (e.g. spatulas, tongs, basting brush) should be kept in a drawer by your stove. If you need a little more organization in these drawers, you should add some bamboo dividers. While this kitchen organizing tip will take you about 30 minutes, it’ll be time well spent: Sort all your supplies into bins that are labeled as daily cleaners, dishwashing, special cleaners, and miscellaneous. The next time you’re cleaning something you’ll save time and money by pulling out what you need instead of having several duplicate items always open and on hand. Loading items in groups in your dishwasher (e.g. glasses, cups, plates, spoons, forks, knives) make it easier for you to unload later. You should also take everything that comes apart, apart so water doesn’t collect inside the item. Before you turn your dishwasher on, make sure you run some hot water in your kitchen sink so your cycle starts with hot water, not some cold water.